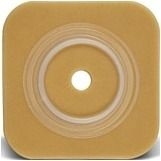 45 mm (1 3/4") flange, Overall dimension 4" x 4"
The SUR-FIT Natura® ostomy system is a comprehensive product line with our latest skin barrier technologies. The plastic coupling ring allows the pouch and skin barrier to snap together for audible security. Durahesive® skin barriers are designed for people whose stoma output is mostly liquid. Unlike other skin barriers that can breakdown around liquid output, Durahesive® skin barriers swell up or "Turtleneck" to further protect the stoma and peristomal skin. Durahesive® skin barrier provides added protection from liquid output.